Ho Ho Ho! Embrace the spirit of the season with this jolly, bewhiskered Santa on his sleigh and his bag full of toys. 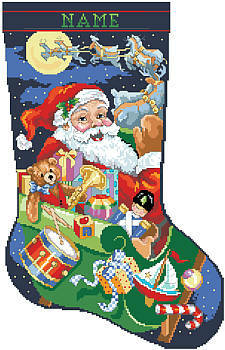 We've got a Stocking for everyone so check out the rest of the Kooler collection! Contents: Stitch count 147w X 224h. Finished size on 14 ct 10-1/2" X 16"